Bridal Shower Food - What Food to serve at Bridal Shower! As a host you need to plan what type of food and drinks should be served at the party. Planning the time of the party is the first step to deciding what food and drinks to serve. Decide whether you are organising a Brunch menu, Luncheon menu or an Evening Party menu. You will need to start planning whether you need recipes for appetizers, recipes for cakes, recipes for cupcakes, recipes for desserts, recipes for finger food, recipes for hors d'oeuvres or ideas for snacks. An important part of planning is to make the decision as to what food to serve at Bridal shower. Then you will need to start planning what drinks to serve! Will you need to start searching for Bridal Shower punch recipes? We have provided lots of articles with helpful tips, hints and ideas for creating a perfect food and drink menu for your party. Are any of the guests Vegetarian? Do any of your guests have food allergies? Are the meat dishes served made from Halal / Kosher meat? How will the food be served? Buffet, Sit down meal or even a BBQ? Have you catered for a variety of tastes? Do you have enough plates, cups, napkins, knives and forks? Have you thought of any food ideas to match your theme? If children are attending, have you catered for their tastes? Have you got enough drinks for everyone? Will you have a desert option? 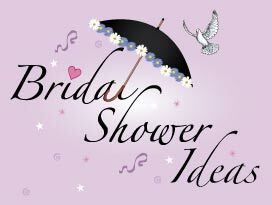 The recommended length of a Bridal shower is two hours. Fitting in a sit down meal, games and gift opening as well as some conversation into a two hour party can be a bit of a squeeze. Buffets are ideal for Bridal showers as guests can mingle and you can provide food to cater for a wider range of tastes. Why not have a BBQ if the weather permits and have an outdoor bridal shower? It is important to make sure you have enough plates and cutlery for all your guests and that there is a choice of food for vegetarians as well as meat eaters. A good idea for a Bridal shower buffet is to label each of the dishes and indicate whether it is suitable for vegetarians or those with nut allergies, this tip will save you time answering lots of food related questions! The weather is another important consideration! If the Bridal shower is going to be held during the summer then think about the length of time the food will be available for guests. Leaving food uncovered for too long could cause health issues, the last thing you want you Bridal shower to be remembered for is food poisoning! We hope that these printable, free Bridal Shower Food Ideas will give you some great ideas for having fun and serving fantastic food during your Bridal Shower Party and celebration! Throw a party! Themes! Decorations! Party Hosting Hints, Tips and Ideas! What types of food? Easy Instructions!